An atrophic scar can occur anywhere on the body, although most of my patients decide to have facial or more noticeable atrophic scars treated. The characteristics of atrophic scars are irregular with jagged edges and a pitted, sunken, chicken-pox-like appearance. They are generally caused by damage to the underlying tissue of the skin.2 This tissue damage is caused by a loss of muscle or fat and the lack of sufficient collagen production in the area resulting in a sunken, depressed structure. A few examples of causes include: severe acne, chicken-pox, surgery or accidents that cause trauma to these underlying structures. 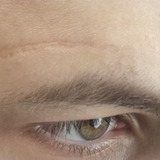 These scars are of a permanent nature if left untreated.2 Atrophic scars can be treated in a number of ways, with one of the most common being fractional laser or selective waveband technology (SWT). Other medical options available include subcision, hyaluronic acid fillers to raise the scar, chemical peels, microneedling or medical micropigmentation. 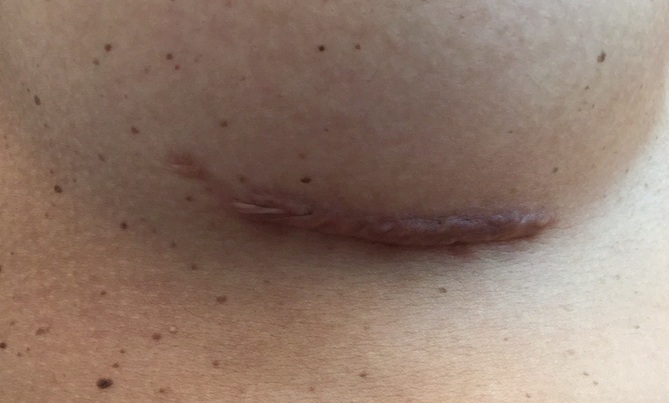 Figure 1: Raised hypertrophic scar before (top) and four weeks after (bottom) one session of steroid injections. I would recommend that the patient has potentially one more steroid injection, followed by one to two SWT/laser sessions and hyroquinone cream to correct the colour. Keloids are benign, dermal, fibroproliferative tumours characterised by excess collagen at the site of previous skin injury.4 The treatment of keloid scars remains a challenging clinical dilemma for both patients and providers. Intralesional cryosurgery has emerged as a safe and effective new treatment by destroying the hypertrophic scar tissue with minimal damage to the skin surface.4 Keloid scars extend beyond the borders of the original wound because of the excess collagen formation when the skin heals. This is in contrast to hypertrophic scars, which are limited to the original wound site. Keloids often develop as soon as three months after injury, but may take several years to appear following the initial traumatic insult.4 Keloid scars are well-demarcated, rubbery, mildly tender, bosselated tumours with a shiny surface, often marked by telangiectasias and sometimes ulcerations. Lesions are pink to purple in colour and may display hyperpigmentation. The most common areas where keloids form are the anterior chest, shoulders, ear lobes, cheeks, and skin overlying joints. After development, keloid lesions continue to persist without spontaneous regression and have no malignant potential. Patients often complain of feeling pain, itching and hyperesthesia. These symptoms, along with the contractures from excessive scar formation, can be extremely uncomfortable for patients.5 A histological examination of a keloid reveals larger, thicker, and more disorganised collagen fibres than those seen in normal skin.4 They are pale-staining, hypocellular type I and III collagen bundles that lack nodules. Blood vessels are scattered and dilated, contributing to the poor vascularisation in keloid scars. Special stains can detect the overproduction of fibronectin, an extracellular matrix protein, which influences the formation of keloid scars.3 Excessive scar formation is due to abnormal wound healing following any injury to the deep dermis. Common causes include surgical procedures, piercings, vaccinations, lacerations, and burn injuries. Normal wound healing depends on the fine balance between extracellular matrix deposition and degradation.5 Keloid scars endure a longer inflammatory period compared to other scars, during which immune cells and pro-inflammatory cytokines continue to stimulate fibroblasts.5 The likelihood of developing a keloid scar is multifactorial with a strong genetic component. 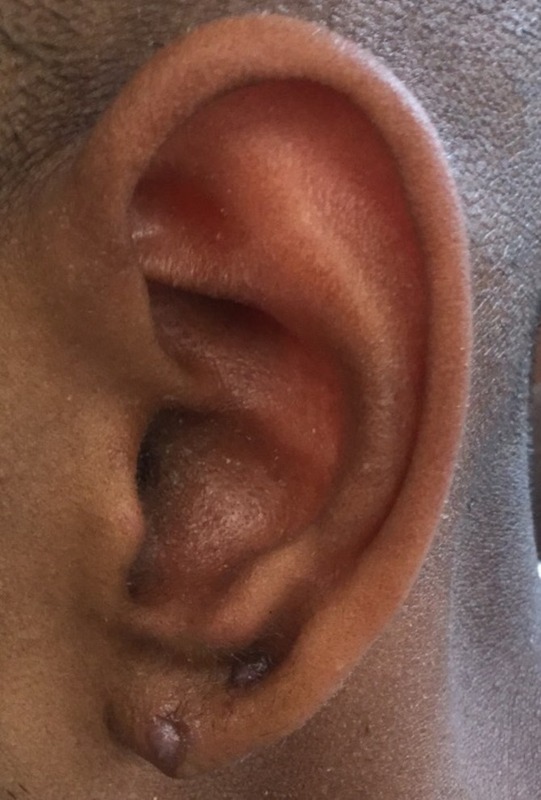 There is potential for all individuals (except those with albino skin) to develop keloid scars; however, the greatest incidence is observed in patients of darker skin colour. Keloids are most common in the second to third decades of life, and susceptibility decreases with age following this.5 Treatments include: electrosurgery and steroid injections. 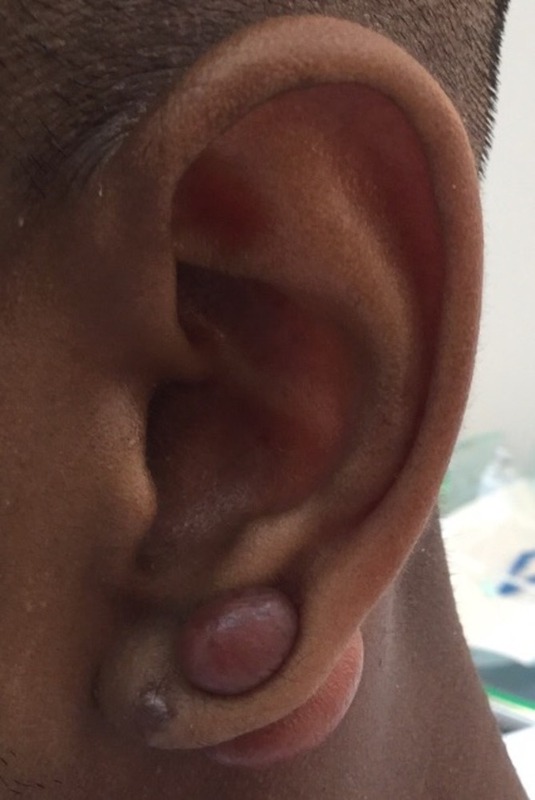 Figure 2: Keloid scars with nodules on the front and back of earlobe before and four weeks after treatment with electrosurgery and steroid injections. 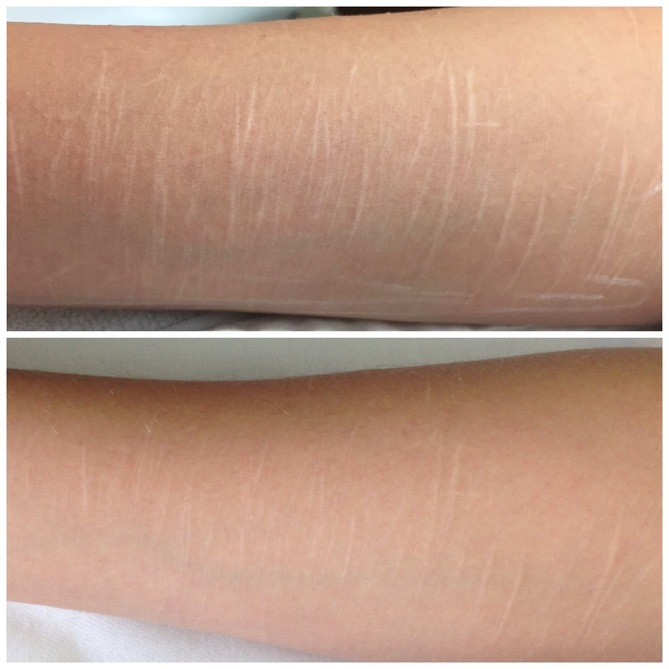 Most scar re-pigment procedures will require multiple sessions, due to the area being damaged tissue. Every patient will be advised upon consultation, as it is completely dependent on the area, however it generally takes between two to four sessions. Patients must be aware that maintenance is required every 12 to 18 months and so they must be motivated to pursue the relevant sessions as per recommendations by the specialist. During and after the procedure the area will display redness and perhaps capillary breakage that resembles the original trauma. Areas with substantial hyper-pigmentation may not be suitable for medical micropigmentation as needle intrusion can worsen the condition. In these cases, I would rather prescribe a 4% hydroquinone cream to reduce the colour. The thickness of the scar will influence the final colour outcome and pigment retention. Some scars can either reject pigment, in which case additional sessions will be required, or they may retain pigment creating dark patches in which case I would prescribe a 0.1% tretinoin cream and chemical exfoliator to exfoliate the area. Correct and diligent aftercare is given to all our patients to avoid potential infection from occurring. Redness, inflammation and scabbing is a natural part of the healing process which usually subsides within four to seven days. 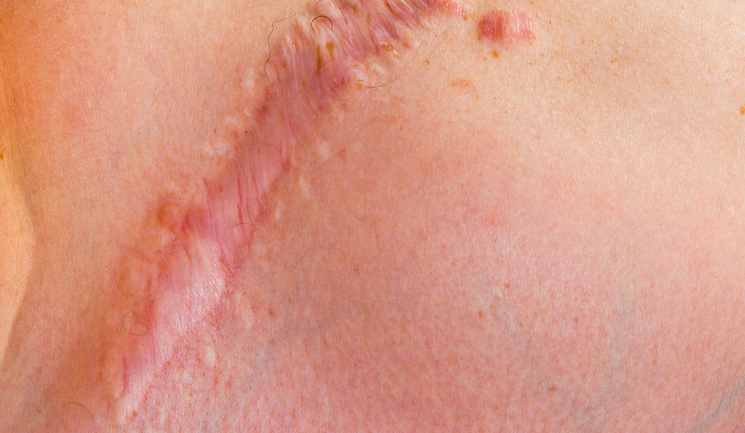 The scar will not appear camouflaged immediately after the initial procedure, in most cases results are seen after two weeks. Fractional laser resurfacing is a popular treatment utilised for the treatment of atrophic scarring, surgical scarring and striae. At the London Cosmetic Clinic we use a fractionated non-ablative laser that delivers a large number of very small spots per square centimetre of the skin. These columns of energy create a heat reaction in the dermis, which works on the principle of injury and repair leading to reversible necrosis resulting in collagenases, angiogenesis and structural changes within the dermis and scar tissue.7,8,9 Treatments are performed at six-week intervals and a course of three treatments is recommended. A topical anaesthetic such as EMLA or LMX 4 is applied prior to the application of the laser to reduce any discomfort. There is little to no downtime associated with this procedure, the patient will usually feel a mild sunburn sensation and there will be mild to moderate erythema present, depending on the sensitivity of the patient. For any residual redness such as post-acne inflammation, post-surgical scarring, or pre-medical micropigmentation procedures, the laser treatment aims to diminish the redness of a flat scar. This can be performed as soon as three weeks after surgery for optimal results, providing sutures have dissolved/been removed. 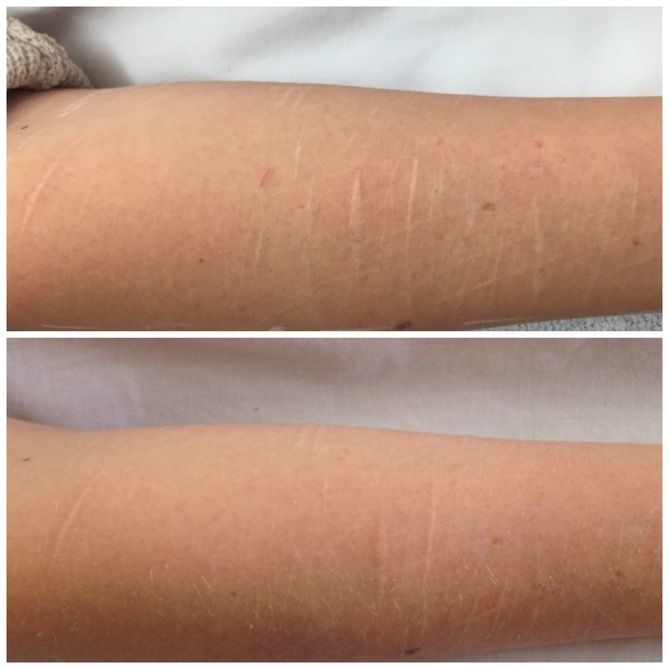 SWT will treat the very light salmon-coloured scars using the sub millisecond pulse.10 Practitioners should be trained thoroughly on the administration of SWT and take care to ensure that the appropriate energy levels are delivered safely with the most suitable pulse duration used. Above all, it is my aim to make patients feel as comfortable and relaxed as possible, and to make them aware of their options and the realistic outcome of any treatment. At my clinic, we pride ourselves on patient care and experience, ensuring our patients’ visit and treatment is as informative, comfortable and professional as possible. A thorough medical consultation should always be undertaken to ensure all concerns are managed successfully. Pre and post information should be supplied to all patients prior to the selected treatment, as well as scheduled follow-up appointments to ensure the correct result has been achieved. Sund B., ‘New developments in wound care’, PJB Publications, (2000), pp.1-255. Gauglitz GG, Korting HC, Pavicic T, et al., ‘Hypertrophic scarring and keloids: pathomechanisms and current and emerging treatment strategies’, Mol Med., 17 (2011), pp.113-125. Har-Shai Y, Mettanes I, Zilberstein Y, et al., ‘Keloid Histopathology after intralesional cryosurgery treatment’, J Eur Acad Dermatol Venereol, 25(2011), pp.1027-1036. Thomas DW, Hopkinson I, Harding KG, Shepherd JP, Int J Oral Maxillofac Surg., 23 (1994), pp.232-6. Beasley K, Dai JM, Brown P, et al. Ablative fractional versus nonablative fractional lasers-where are we and how do we compare differing products? Current Dermatology Reports. 2013;2:135–143. Harithy Ra, Pon K. Scar treatment with lasers: a review and update. Current Dermatology Reports. 2012;1:69–75. Bogle MA, Yadav G, Arndt KA, Dover JS. 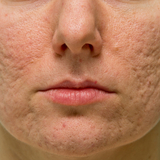 Wrinkles and acne scars: ablative and nonablative facial resurfacing. In: Raulin C, Karsai S, editors. Laser and IPL Technology in Dermatology and Aesthetic Medicine. Berlin Heidelberg: Springer; 2011. pp. 289–297. Leventhal D, Furr M, Reiter D, ‘Treatment of keloids and hypertrophic scars: a meta-analysis and review of the literature’, Arch Facial Plast Surg. 8(6) (2006), pp.362-8.